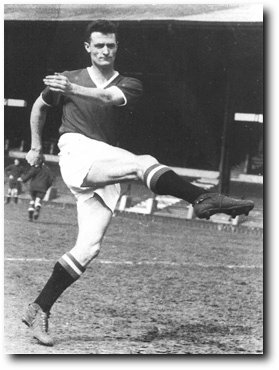 Liam Whelan was a soccer artist whose brains moved faster than his legs. On the ball he could look awkward, even clumsy, yet he had the knack of ghosting past opponent after opponent with the merest of shimmies. And once within shooting distance he was a man to respect, as his record of better than a goal every two games testifies. Indeed, in 1956/57 Liam netted 33 times in 53 senior outings - and he wasn't even playing as an out-and-out front man. A vivid example of his talent came in the quarter-final of the European Cup in Bilbao that same season. He picked the ball up deep, shuffled half the length of the pitch leaving five defenders in his wake and scored with precision. The quietly-spoken insidc-forward, whose engagingly modtet personality was never altered by his success with Unitcd and the Republic of Ireland, played his football with a deceptively relaxed air. Certainly there was nothing casual about his work in the penalty area and he could be especially lethal with his back to goal. One of soccer's more persuasive dummy salesmen, he found an unwilling customer in the shape of a bemused Wrexham defender in January 1957. The subtle flick, which found the net when no danger seemed imminent, was the work of a conjuror. If this dream of a dribbler had only possessed pace he would have ranked as one of football's all-time greats, even though his career - and his life - ended at Munich. As it was Liam didn't always get the credit he deserved and didn't realise just how good he was. United's coaching staff, however, were under no such misapprehension, right from the moment he was signed as an l8-year-old from Home Farm with the urgent initial task of replacing the injured John Doherty in the 1953 FA Youth Cup Final against Wolves. Liam - or Billy as he quickly became known to Mancunians - starred in a 7-1 first-leg victory and was marked down for an illustrious future. Indeed, so eyecatching were his gifts that, following a fabulous display in a youth tournament in Switzerland, the club received a discreet inquiry from Brazil about his availability. Needless to say, further interest was not encouraged. The boy's development continued apace; soon he was a major creative and goal scoring force at senior level and the honours began to mount. Yet such was the wealth of talent available to Matt Busby in that glorious era that, at the time of the Munich disaster, the 22-year-old Dubliner was being kept out of the side by one of his closest friends, Bobby Charlton. Of course, he had so much to give that, sooner or later, he must have reclaimed a place, even if it had not been at Bobby's expense. Liam was a devout Roman Catholic and, to the last, his faith never wavered. As United's plane made its fateful third attempt at take-off from that slushy German runway, he was heard to murmur: `If the worst happens I am ready for death......I hope we all are.' The tragedy was that the soccer world was far from ready to lose Liam Whelan.